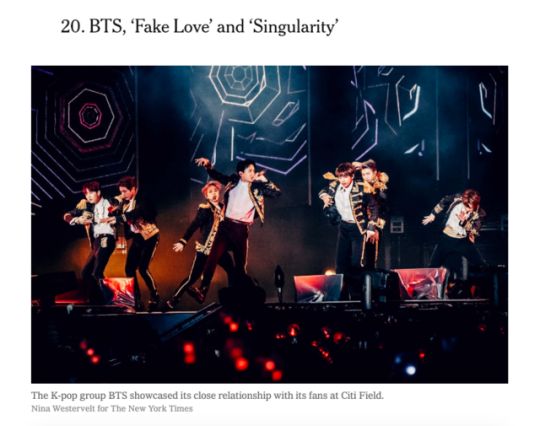 BTS's "FAKE LOVE " and "SINGULARITY" #20 on New York Times "65 Best songs of 2018"
watch the rest of the songs here! The world SOTY, FAKE LOVE! Kings at top 20 with 2 songs. Congrats. Both songs of absolute quality, both deserve it. I feel like Singularity doesn't get its due praise so I'm especially glad to see it on this list. I'm happy that Singularity is in the list. It's a very good song and deserves all the praises. Taste. Glad that Singularity is getting the recognition too. Fake Love is that btch. Two top-tier quality songs getting the love they deserve. Love Yourself: Her was THAT album. Not a single hated song. Love a queen. I'm glad that my fav Fake Love being recognised by many critiques as a quality song, which kpoppies tried to slander as bad pfft.